Knowing you need to lose weight is not the same as being able to do it. Let’s face it, getting out of bed to run 5 miles every morning and then eating lettuce all day is just not an attractive option. You need to develop a strategy; this is the only way to achieve the results you want and need. This short guide to the best weight loss strategies for older men will help you with the transition. The real issue is not actually losing weight, it’s the fact that no one warns you that as you age your metabolism starts to slow. A low metabolism makes it harder to lose and easier to gain. Fortunately, these weight loss strategies for older men can help you without the need to count calories every day. Of course, there is no magic solution. But as these weight loss strategies for older men will show you; it is possible to lose the weight and keep it off by making a few simple changes to your lifestyle. The best part is that these changes are easy to implement and can become part of your life. You don’t need to stop eating certain foods or count every calorie; just adopt one or all of these weight loss strategies for older men! Maintaining a proper diet is the most important step of weight management. Your body needs to consume fat, carbohydrates, protein, and vegetables. The question you face every day is how much of each should you be consuming to lose weight? In reality, it is easy to get the balance right. All you need is a plate and some meal ideas from our free 1-day meal plan. 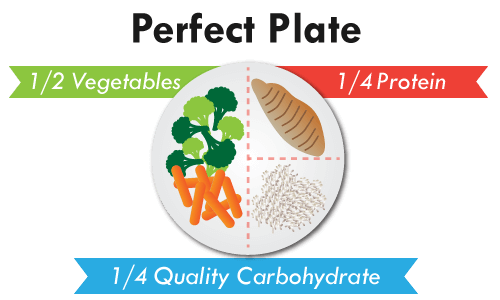 The perfect plate focuses on having half a plate of vegetables, ¼ of carbohydrates, ¼ lean protein, and a little fat. One of the best weight loss strategies for older men is to understand and portion control of macronutrients. Vegetables – you know what these are! It is best to opt for fresh green vegetables and always choose the ones you enjoy. Lean Protein – Focus on low-fat meats that have been organically raised. Chicken, beef, turkey, trout, salmon and even whole eggs are great sources of protein. Carbohydrates – Not all carbs are equal. You need to focus on the ‘slow carbs’. These are foods like brown rice and bread, berries, and oats. Fast carbs which are present in white foods including bread and rice should be avoided. Let us do the heavy lifting for you! Download our free meal plan to get started with a deliciously effective new way of eating. The perfect plate one of the best weight loss strategies for older men that you’ll come across. The biggest part is identifying the foods you should be eating, pre-plan your meals if you wish and then balance the portions on your plate. You can start doing it today and keep going forever! Eating healthily helps you to lose weight. As the other two weight loss strategies for older men show; it is easy to adjust your eating habits and start losing weight. But to really get the fat burning machine going it’s a good idea to start exercising. The great news is that you don’t need hours of free time to get in a good workout. If you haven’t done any exercise in a while then you need to start slowly and build up your fitness. This can be done with walking, jogging or cycling. However, high-intensity workouts are generally found to be more effective and can be completed much quicker. The more work you're able to do, the better shape you'll be in. Obviously, it is important to not overdo it, but you'll have to be the judge of that. A High-intensity workout, also known as HIIT involves a short burst of energy to complete an activity followed by a short rest period. Another exercise is immediately continued for a short period, with another period of rest. There are different versions of HIIT. The Tabata which means exercising for 20 seconds then having a 10-second break. You should aim to complete 3 minutes for each exercise, ideally doing 7 or 8 exercises total. If this is too much to start with then do 1 minute for each exercise and work your way out. That means you can start losing weight in just 7 or 8 minutes and the full routine will only take you half an hour! Other HIIT routines offer different rest periods and exercise periods. Take a look at this article to give you some excellent examples of how to get started with HIIT. Once you’ve started the habit of doing HIIT you’ll find that this is actually enjoyable and it will help you burn the fat! Intermittent fasting is one of my preferred methods of losing weight. I know it works because I’ve successfully used it! One of the most common methods for intermittent fasting is to choose two days a week; preferably not next to each other. On those two days eat only 500 – 600 calories; the rest of the week you eat normally. Yes, I said there was no calorie counting but with a little help from our free 1-day meal plan, you’ll find this is a simple process and you only need to do it twice a week! For the rest of the time, you can eat as you normally do. While avoiding certain foods will help you to lose weight faster, intermittent fasting will reduce your overall calorific intake; helping you to lose weight. If you prefer; you can fast for 24 hours once or twice a week. However, this is one of the most difficult weight loss strategies for older men as the first approach to fasting. Alternatively, try fasting for 16 hours every day; your sleep time can be included as part of your fast. You then eat normally during the other 8 hours. Intermittent fasting works because it deprives your body of easily available glucose. Your body then needs to convert fat into ketones to create an alternative source of energy. You don’t need to be exercising for this to happen. You use energy all the time to power your organs and muscles. By removing the easy energy sources (sugar and carbs) for a period of at least 8 hours, your body transitions into the fat burning mode known as ketosis. This is one of the best weight loss strategies for older men because it is so easy to start and adhere to. The first step in using one of the best weight loss strategies for older men is to commit to a weight loss plan. This requires you to feel motivated; a special event can often be enough to get your motivation going. But to keep it going for the long term you need to build long-term habits; you can do this by creating a routine and sticking to it. All of these strategies work fairly well on their own, but adopting them all is the very best method to achieve results. Start by downloading our free meal plan and making a commitment to a healthier lifestyle. *Please know that weight loss results & health changes/improvements vary from individual to individual; you may not achieve similar results. Always consult with your doctor before making health decisions. This is not medical advice – simply very well-researched info on weight loss strategies. Are you part of the 71% of men who say they dont workout enough? Admitting you need to do more is a great first step, but motivation by itself will only get you so far. Use these workout tips for men to maximize your gym time. These tips will make the difference between going through the motions and seeing real results. Getting started with a new routine is much easier when you have the right approach. These workout tips for men are separated into sections; ensuring you understand how your exercise plan needs to affect every part of your life. Of course, I know you already lead a busy life, finding time to exercise can be difficult. But, with the aid of fantastic routines such as the free 24-min workout; you will always be able to fit exercise into your schedule. Think about the food you eat; it has a direct effect on your energy levels and the efficiency of your muscles when working out. A balanced diet ensures your body has all the right nutrients to maintain energy levels and minimize fat storage. Avoiding processed foods and eating fewer calories than you actually need, will lead to weight loss success. More calories can help muscle building but lose the excess weight first! Instead of grabbing a takeaway or frozen ready meal at the end of a busy day, prepare your meals for the week in one go; this will ensure you eat healthily. Try the Fit Father 1-day meal plan to get you started. Your body is 60% water; so not drinking enough can lead to dehydration, energy loss and a variety of other issues. The average man should drink 3.7 liters a day, but you may need more when you exercise. One of the most commonly prescribed workout tips for men is to drink a protein shake before you exercise. If you are looking to lose weight, stick to water and drink whenever you feel thirsty. Sleep is the time when your body heals itself, corrects hormone levels and builds muscles. Getting between 6 and 8 hours a day will help to ensure you have the energy for your workout and get the best possible results. Pick the time when you are most energetic and stick to it. One of the best ways to get workout success is through building a habit. 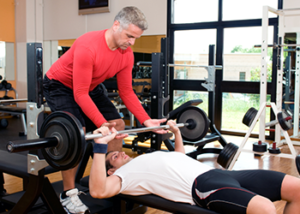 If you are hitting the gym you can benefit from the advice of the trainers on hand. However, knowing how to use a machine does not mean loading the weights up. While you want to train to exhaustion for endurance and strength, you need to protect yourself from injury. Start low; you can always add more weight. It is vital to stretch your muscles before you start a workout. This allows them to do more without causing you an injury. The best way to approach your stretches is to warm up for at least three minutes and then use dynamic stretches such as trunk rotations, side bends, and abdominal stretches. After a workout, you should also cool down with some static stretches; such as the chest stretch and the calf stretch. Single muscle exercises like the bicep curl have their place in any workout. However, there are generally better for targeting specific muscles. Compound exercises such as the DB Squat will work several muscles at once and build core strength. Before you use any bench in a gym test it with your thumb. If you can push your thumb into the wood use a different bench; it will not give you the support you need for your routine. You can choose to warm your muscles by wrapping them with warm towels or sitting in a warm room. This will increase blood flow and help prep your muscles for your workout. But, this does not mean you shouldn’t stretch, your stretches will just be easier. Perhaps one of the best workout tips for men over 40 is to hold each stretch for 60 seconds. In your 20’s thirty seconds would have been enough, but as you age you need to give them more time; you will feel the benefit during your workout. If you are looking to lose weight then the best workout tips for men over 40 is to undertake a 20 minute HIIT session 3 times a week. This will elevate your heart rate and force your body to burn fat. On the days you are not performing HIIT you should be completing your metabolic resistance training; keeping your body active and your fat burning. The most effective way to complete any exercise is with a buddy. They will inspire you to keep going even when you want to quit. More importantly, they will ensure you are doing it correctly; allowing you to gain from the exercise and not injure yourself. One of the best workout tips for men is to be flexible n your approach. You may not always be able to get to your gym; especially if you travel a lot. However, learn a few free weight or bodyweight exercises and you will be able to complete a routine anywhere in the world. Most gyms have free weights or you can use a suitable substitute. When working out you need to complete the right number of reps and sets. You will find it easier to do if you count down the reps rather than count up. Your body is surprisingly good at adapting. If you complete the same routine every time it will become accustomed to it and you will get much less benefit. Never be afraid to change the order of your workout, swap days or even do something completely different. Keeping active and challenging yourself is what will make sure you achieve your goals. Within 30 minutes of completing a workout, eat some carbs. This will provide your body with the nutrients it needs to repair and grow your muscles. No matter whether you are looking to lose weight or gain muscle this is one of the most important workout tips for men, as it is absolutely essential to repair your body after an energy depletion. These 15 workout tips for men are just the beginning. You can access the Fit Father Program to gain more insight into the routines you should be completed to reach your goal. Perhaps more importantly, you will also be able to communicate with other, like-minded people, this will provide you with all the inspiration you need! Don’t delay any further, try these tips today with some simple exercises; or use our 24-min workout to blast your fat and build muscle. Then tell me all about it; you can be another of our success stories. Finding out you are going to be a father for the first time is a life-changing moment. It’s as if a million emotions hit you at once. Joyfulness and excitement change to doubt and fear as the fateful day draws near. You question whether you are ready for this. After all, you still read comic books, watch cartoons, and eat Peanut Butter Captain Crunch cereal. You don’t remember your own father doing any of those things. But then again, did your father relate to you, when you were a kid? Maybe you and your future child can bond on the things that make you unique. I used to be concerned about how I would be as a father. After a bit, I realized there are millions of bad fathers out there that seem to have no idea what they are doing. I can’t be any worse. Below are a few tips for new dads to keep in mind as you enter into fatherhood. You might want to print these out and hang them on your fridge to remind you to take a breath and calm down now and then. Am I Too Old or Too Young to Have a Kid? I taught elementary school for ten years working with children mainly from five years old to 12 years old. During parent-teacher conferences my first year of teaching, a few of the parents were asking me for advice on how they should be raising their children. I would have been better suited to tell a doctor how to perform brain surgery at this point. I didn’t have a kid of my own and this was my first year of officially being an educator, so I came up with some basic things like getting them to bed on time or brushing their teeth twice a day. I had no clue what to tell them. But as time went on and I approached my fifth year of teaching, parents would still ask me for advice several times a year. I still didn’t have a child of my own, but you would have thought I had 20 kids by the amount of advice I was spouting off. I was like Yoda sitting at the top of a mountain and sharing my supposed wisdom with the fortunate few. I had tips written on a sheet of paper for each of the parents and handed them out during the conferences, whether the parents wanted them or not. During this time, I would have meetings with parents that looked young enough to still be in high school. They were merely kids themselves, and now they were responsible to raise one. I also encountered the complete opposite with parents that I would have originally guessed were actually senior citizens. I used to comment to others these couples would always have people thinking they are the kid’s grandparents. I quit saying this and my smile slowly faded when I was reminded that my own child will be graduating high school when I am 60 years old. There is no perfect age to have a child. At least, not for us fathers. We don’t have a biological clock ticking away. There are wonderful young parents and there are awe-inspiring older parents. You just need to make the effort and commit to your family for the long haul through thick and thin. The phrase “monkey see, monkey do” has been around for ages. It means essentially for a father that your children will mimic what you do in life, both the good and the bad. You really must keep this in mind when your child is born. Your actions can greatly influence their behavior, so use this power wisely. Get into the habit of being the best person you can possibly be once your baby arrives. Eliminate any bad habits that you might have. If you smoke, stop smoking now. If you tend to drink too much, cut it back. If you are overweight or even clinically obese, it is time to start shaping up. Join a gym and start to become healthy before the baby arrives. This is just as much a commitment to your family as it is to yourself. My own father had a heart attack in his early 40s and it was all because he was not taking appropriate care of himself. He almost left nine children behind simply because he could not put down the unhealthy things and start exercising. There are amazing exercise programs currently out there that will get you in shape in no time. But remember, exercise is only about 20 to 25 percent of being healthy. The rest is if you follow a healthy diet. With obesity running rampant in our society, won’t it be great knowing that your own child will follow in your footsteps of being a healthy and fit individual? As first-time fathers, it is quite ordinary for us wanting to have a baby boy. We want to be able to play sports with them, watch wrestling, and work on our cars with them. With that said, you should just be happy that your new child is born healthy. Boy or girl, it doesn’t really matter in the long run. I always felt like I wanted a boy first until after several years of teaching elementary students. It basically dawned on me one day that my favorite all-time students were almost always girls. They listened much better, behaved very well, and didn’t complain much at all. In fact, they would often bring me little gifts for no reason at all. This is when I wised up and realized boy or girl, I can’t go wrong. There are going to be times early on when you have to be brave as a new father. The acts of bravery actually begin once you enter the delivery room with your wife. It’s like a scene from one of those Alien movies. Whatever you do, don’t pass out. You’ll be stealing your wife’s thunder and the story will be shared until you die. Your next act of bravery will probably be changing a diaper. Good luck with that. In my family growing up, my dad was the one to fear. He would yell first and ask questions later. To say he was the enforcer would be an understatement. I spent most of my young life afraid of him. However, it shouldn’t have been that way. Instead, my parents would always play their set roles. My mom would be there for school related things and my dad was always there ready to keep us in line. Especially in this day and age, there are no set roles anymore. Your wife might be the breadwinner of the family, and you should be fine with it. Quick confession time, my own wife is a doctor and makes very good money. My friends would often ask if it bothered me that my wife made so much more than I did. They said it would bother them. However, I couldn’t care less. The good cop, bad cop, and breadwinner roles are a thing of the past. If you are a better cook than your wife, you can make the meals every night. Don’t worry about roles because everything is eventually overlapping anyway. You’ll be playing all the roles at different times. And remember, it is not babysitting if it is your own kid. When someone new comes in the house, pets can feel a bit betrayed. A person gets so busy doting over their new baby that they forget about their best friends. Take time out of your busy schedule the first couple of days your baby is home and introduce your pet to your new kid. If your dog or cat understands that they are not competing for your love, they should welcome the newest member of the household in no time. Choosing a name for your new child is sort of a big deal. In fact, the hospital will not let you leave until a name is chosen. How it usually works is your wife has one idea for a name and you have a completely different one. Trying to bargain and compromise can frustrate even the calmest individuals. However, there are certain guidelines you should follow when choosing the best name for your new baby. It is okay to make the name unique, but don’t go overboard with one that sounds like it came from another planet. Also, while you may find it cool naming your child Optimus Prime or Ultimate Warrior, the rest of the world may not. In addition, try to avoid the unusual spelling syndrome. You may think it adds character to the name, but it can be awfully confusing. Think of the NBA player Dwyane Wade. Yes, that is how his first name is spelled. However, it is pronounced like Dwayne. I once had a student in my class whose name was spelled B-R-A-I-N. To most people that means his name is apparently Brain. Pretty gutsy to call your kid Brain from the get-go. But his parents would be quick to inform me that his name is pronounced differently than how it is spelled. They said that B-R-A-I-N is actually pronounced Brian. When did the duty of naming a child to signify that you can disregard all the rules of phonics? If you need a bit more guidance on how to become a great father, go no further than watching classic television shows. Here are some shows that should be required viewing for first-time fathers. Leave it to Beaver: Ward Cleaver is perhaps the best tv dad you will come across. He recalled what it meant to be a kid. While his wife June seldom understood why certain things would be embarrassing for Wally and the Beaver, Ward could always fondly relate to the situation. He was stern when he needed to be, but love the rest of the time. If you can be a father like Ward Cleaver, then you are doing something special. Brady Bunch: Mike Brady not only was raising three boys on his own, but he decided to marry a lady that also had three girls. In the age of blended families, this show was ahead of its time. Plus, Mike Brady was all accepting of his new girls and never once referred to them as stepdaughters. Andy Griffith Show: Andy Griffith played Andy Taylor on the show and was maybe the first single dad ever portrayed on tv. However, this didn’t stop him from being the best parent of all time. Not only did he spend time with Opie (remember what we said about unique names) doing fun things like fishing and sports, but he also made no qualms about disciplining him when needed. One of the best things you can do for your family is to commit to an exercise program and a clean diet. Give your child a chance to know their father by sticking around for a long time. Furthermore, be active enough so you will still be able to have adventures and create memories with your child as they get older. Don’t be the father that hides away in his den all day and night. Join in with your child’s activities. Ryan is a fitness expert from Illinois with two decades of experience under his belt. Never one to turn down a challenge, he has taken every class any gym has to offer, even the Dance Kickboxing class. If 70s disco dance music starts playing, everybody should run for cover. You have never lived until you have kicked somebody in the head to Dancing Queen. *Please know that weight loss results & health changes/improvements vary from individual to individual; you may not achieve similar results. Always consult with your doctor before making health decisions. This is not medical advice – simply very well-researched info on tips for new dads. You may have heard of the saying “if you fail to plan, you're planning to fail.” It was original said by Benjamin Franklin and is something you should take to heart. Whether you have a workout schedule that needs rethinking or are just looking to start one; planning is the essential first step. The simple fact is that a workout schedule allows you to choose the best exercises for your goals. It will give you a sense of purpose and help you to make the most of the time you have available. Perhaps most importantly a good workout schedule will help you to see results; because if it doesn’t you can simply rethink it. Without a plan you won’t know where you are going wrong. It’s great that you’re ready to start working out or that you’re already doing it. But now it’s time to make your exercise count. Let the Fit Father’s guide you through creating the perfect workout schedule. We are here to support you on every step of your journey. There are several steps you need to take in order to maximize what you fit into your workout schedule. Consider what are you goals? Are you simply looking to lose weight? Perhaps you’d like to be more toned or muscular. Or, maybe you are looking to compete and need to get fit enough to do so. Knowing your main goal will allow you to set small targets and choose the right exercises for your body. The toughest part of your workout schedule is sticking to it. In general you need to keep doing something for a month in order to make it a habit. Your body will then expect you to workout and this will make it easier to do! Working out more than one muscle group at a time increases your metabolic burn and improves core stability. It is also a more productive use of your time. There are dozens of compound movements to choose from. Try doing dumbbell squats or dumbbell lunges. A good workout schedule will allow you to do strength training and cardio. But, you should move the order in which you complete you workout round regularly. This is known as shocking your body and will keep your body challenged while ensuring it is not becoming used to the routine. Perhaps the biggest part of getting the most out of your workout schedule is to learn a few simple exercises that will work your whole body. This will allow you to get the most from your workout in the shortest possible time. More importantly it will help to ensure you get on with the exercises instead of wasting time deciding what to do. You can try our Old School Muscle routine to see just how simple an effective program can be. When completing the weightlifting part of your workout schedule you need to lift enough weight so that you have just enough energy left to complete your sets. Always err on the side of caution and gradually increase the weights. Pushing yourself to the limit will help to build your muscles and burn fat faster. Finally, it is worth considering implementing High Intensity Interval Training into your workout. Intense workouts like HIIT can really help you to get the most from every workout. But most importantly when creating your workout schedule; make it fun! You are much more likely to stick to it. Having chosen the exercises that will best suit your needs you need to start considering how to improve your focus. The first thing you need to do is write down what your goal is and what your motivation is. This can become your mantra and your reminder to exercise; even when you don’t feel like doing it. Having a defined goal will help you to move towards it. There is little better to improve your focus than engaging n some friendly competition. Get a friend to exercise with you or simply use the Fit Father’s as your competition. There are certain to be others at the same level as you. Creating a workout schedule means choosing the activities you wish to do in the time you have. The second part of this is to select a time to complete your workout. Put your chosen slot into your diary and stick to it; in the same way that you would any other appointment. Your workout is a priority; once you’ve added it to your schedule you shouldn’t change it. This will ensure you actually complete the workout and don’t just have good intentions. It is also time to evaluate your role at work and even at home. The truth is that many of us take on extra work to help the business without relinquishing old duties. It can be difficult to let go but it is essential to provide you with the time you need for your workout schedule and your family. Life should not be all work. We’ve mentioned challenging your body by mixing it up. This is to improve your results. But challenge is also essential to improve your focus. Trying something new or a different approach will force your frontal cortex to work harder. This will ensure you are focused on the task in hand. You can also inspire and push yourself further by imagining that if you fail at your current activity there will be dangerous or even life or death consequences. There is no doubt that having a good workout schedule will ensure you get the most from every minute you have. Goals can inspire you to push on when you really don’t feel like it. But in general humans are reward based creatures. Give yourself a reward for achieving a certain goal; just don’t make it one that will damage your weight loss or muscle building efforts. Rethinking your workout schedule is something that you should do on a regular basis. This will keep you challenging your body and prevent the routine from becoming stale and boring. Of course it can be difficult to keep coming up with new routines but you don’t have to! Join the Fit Father Project today and all you need to do is decide which part of your body you want to work on. We have an extensive number of exercises which you can add into your workout schedule to help you achieve the right results. Of course, you’ll have the full support of the founders and all the members; that is an impressive amount of motivation itself! When you were a child time was limitless; in fact you wanted it to pass to help you reach a certain height or age. But you didn’t know than that just 30 years later you’d be desperate to find more time. The reason is simple; you get up, get ready and get to work. You work long hours without a proper break and even bring your work home. Despite this dedication there still aren’t enough hours in the day to see friends, date, start a family or even take up a hobby. Digital technology is supposed to have made it easier. Yes, it offers time saving apps; but it also allows you to procrastinate talking to your social media friends. While having a clone version of yourself might give you the time you need, it’s not really an option yet. Fortunately there is a way in which you can find more time for the things you want to do. Adopt the following tips and you’ll soon realize how easy it is to find more time! Do you know how much time you waste daily on simple decisions? If you worked it out you’d be surprised at just how big a number it is. He doesn’t have to think about this simple decision; he just puts his suit on. Apply this attitude to your work wear and your breakfast for just one day and see how much quicker you get ready in the morning. The same is true throughout the day. Simplify, or if possible, eliminate the small decisions you have to make every day by having a stock solution. If you leave the most difficult task to the end of the day you are more likely to procrastinate and waste time. Spend 5 minutes reviewing the items you need to do then pick the most difficult and get started. Not only will this help to focus you, it is also possible to set a time limit on the activity. This will force you to get it done. Take a look at how many meetings you hold or attend per day. Then remove yourself from any that you are not vitally needed at. You should be able to at least halve the number of meetings you attend. It is important to schedule yourself some personal time to handle bills or other personal matters. This can be done during the day eliminating the issue from your evening time. Digital communication is great, but the average employee checks their email 36 times an hour. That’s a lot of wasted time. Get in the habit of switching off your digital devices and only turning them on at set times during the day. You won’t miss anything important but you will be more productive with the time you have. In addition when you do stop to check emails; deal with them straight away. You are simply wasting time reading them only to deal with them later. This may sound funny after the previous tip but technology can help you. For instance, when you’re waiting on hold use a Bluetooth headset, you can keep working while you wait. Of course the tips that help you find more time re only part of the solution. You also need to adopt a new approach to various situations in your daily life. Apply these methods to help you find more time and actually start enjoying life. You’re the boss! Do you really need to be doing all the tasks that you do? Letting go and trusting someone else to do a task that you currently do is hard. You probably don’t believe they can do it as well as you. Truth is you won’t know until you try. Delegate your tasks and free your time up. Your employees will welcome the extra responsibility and the opportunity to feel that they are valued. You cannot do everything. If you want to find more time to pursue your own activities then you need to learn when to say no. Only say yes to the things that have to be done by you or that you are interested in. As difficult as it is, once you start saying no you’ll find it gets much easier! Adding exercise to your day doesn’t need to take more time away. You can exercise while looking through a business plan or reading the minutes from a meeting that you didn’t attend. However, exercise has been shown to improve focus and increase your energy levels. This means you’ll actually be able to achieve more. Of course, it also helps you to stay healthy and enjoy the time you have. In the same vein you need to decide on a start and stop time for work. Achieving your best performance is actually reliant on having downtime. This helps you to focus more when you are working and will ensure you find more time for other activities. By adopting more proactive methods of working and avoiding the procrastination you’ll be able to fit your current workload into a standard working day; allowing you time after 6pm to do your own thing. If evening work is really necessary then limit it to one, or at the most two, evenings per week. Now that you’ve implemented these tips and methods you’ll be wondering what to do with the time you’ve discovered! Join the Fit Father’s and learn about how to exercise in less than 30 minutes per day. It will improve your fitness, health and outlook on life. It’s also a great way to start the day and get you focused for the tasks ahead! The purpose of finding more time is to be able to spend it with those that are important to you. There is little point in having a successful career or business if you can’t enjoy the spoils. Dedicate some of the time you’ve found to see your friends and family; you just need to learn to relax and enjoy yourself. You don’t need to take up knitting or stamp collecting. Find something you enjoy doing; even if it is an adrenaline fueled sport. Then commit to doing it at least once a week. It will be fun and the anticipation of doing it every week will actually help you to focus when you’re working! There is enough time! All you have to do is change the way you use your current time and find more time available. These tips can help you to achieve your goal. Then join the Fit Father Project and start improving your fitness. Not only will it benefit your health it will make you feel like a new man! *Please know that weight loss results & health changes/improvements vary from individual to individual; you may not achieve similar results. Always consult with your doctor before making health decisions. This is not medical advice – simply very well-researched info on how to find more time. How do you shop for groceries? Do you just walk down the aisles of the store looking for discounts and attractive packaging? If that’s your current strategy, you could seriously be putting yourself at risk of gaining weight. 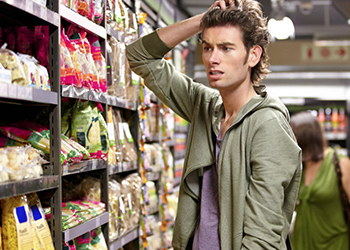 Shopping for nutritional food requires a conscious effort. Marketing practices target unprepared, hungry, and emotionally challenged shoppers. It’s important to go to the store with a battle plan, especially if you’re new to weight loss. Whether you want to lose weight or build a more muscular physique, warm up exercises should be an integral part of your training regime. Warming up properly will not only help prevent injury, but will also maximize the effectiveness of your workouts. Read on to discover the best warm up exercises, joint mobilization, dynamic and static stretches that will give you a better workout and prevent aches and pains afterward. If you want to boost testosterone you're not alone! One look online will quickly highlight the fact that testosterone levels drop approximately 1% every year after you turn 30. That’s why there is such a big market in testosterone booster supplements. It’s understanding why so many men reach for these supplements. Every one of us is affected by the natural decline of testosterone. But we have a choice! You don’t need to use steroids to maintain and even increase your T levels! What you need is some knowledge and the support of the Fit father Project. From a healthy 1-day meal plan to one of the best 24-minute workouts you’ll find anywhere; we can and will help you to boost testosterone levels without jumping through hoops. More Americans are more overweight than ever before, and the rate is climbing. More worrying is that the number of people attempting to lose weight has fallen from 56% in 1988 to 49% in 2014. If you’re one of the people trying to lose weight or no longer trying then it’s time you added loss aversion into your daily routine. What are your weight loss goals? Approximately 53% of Americans are actively trying to lose weight. In the 1950’s the average was 35%. More people are becoming aware of the need to set appropriate weight loss goals. Sadly, the fact is that obesity rates are rising, and the number of people failing to achieve their goals is increasing. The problem is that it can be difficult to lose weight. Fortunately there’s a solution and its right here! I’m sure you’re trying hard. You have probably already looked at our 24-minute workout and adapted your menu according to our free 1-day meal plan. You’ll almost certainly have made a good start, but many people hit a plateau. Suddenly the things that you’ve been doing are not working. The problem isn’t what you’re doing; it’s the weight loss goals you're setting. You’re invited to a wedding, school reunion or even a luxury holiday. Of course you’re suddenly aware that you need to drop a few pounds. You set yourself a goal of 10 pounds. You start exercising, perhaps using the 24-minute workout. You also start eating healthier. The first week you lose 2 pounds! The second week you lose none. The reason is simple; your weight loss goal is too vague. All you need to do is write down what you want to accomplish this year, what you wish to achieve this week, and what you intend to do today. Lose 20 pounds this year. Drop 3 pounds this week. Get rid of ½ pound today. But! You’re goal is still too vague. How do you know when you’ve lost ½ pound? More importantly this type of approach can actually leave you feeling disappointed and ready to give up. For example, if you set a goal to lift 100 pounds, then try and can’t, you’re not going to feel good. The more you try and fail, the more likely you are to give up. You need to adopt the process goal approach instead. This is where it is necessary to redefine the goal. No longer should you look at what you hope to achieve. Instead, consider the process of achieving that goal. This actually sums up the principle of a process goal. You need to focus on the small details. The end target will remain the same, but you’ll get there much faster, as you’ll be making positive steps every day. Create weight loss goals that are attainable. But you also need to know exactly what's needed to reach these goals. Your goal is to lose ½ pound a day. To achieve this you’ll need to plan in advance what food you will be eating that day. In fact, you can use our meal planning guide to help you plan your meals for the week. This will ensure you eat healthy, and don’t over consume calories. Set an exercise schedule. You can opt for the 24-minute workout once a day, or simply walk briskly around the block for 30 minutes. The activity you choose should reflect your fitness level and be something you enjoy. Schedule your day. Put a time in your diary when you will exercise. You can even schedule your meal times; if this helps. Instead of having a goal you have actions that need to be undertaken. You no longer need to think about losing ½ pound. All you need to do is complete the actions you have set yourself! Your focus is no longer on how a goal can be achieved, you’ll simply be completing the tasks you’ve set yourself and achieving your goals; potentially faster than you had hoped. This is not something that you need to reserve for the big goals in life. You can use process goals in every aspect of your life. The fact that you are making something actionable gives you something to do, rather than a vague concept. At work, instead of having a goal to write a specific report you can tell yourself that you’ll write the report for 90 minutes. If you don’t finish the report in this time then you can schedule it in for another day. In this way you’ll get through your work faster as you’ll be focused on each item for a short time. You will also find it easy to tackle the jobs that take you out of your comfort zone as you can schedule yourself a short space of time to look at it each day. The fact that you’re scheduling and committing to regularly completing an activity will ensure your weight loss, or any other goal, is achieved. Undertaking a 1-day meal plan will help you to achieve your weight loss goal. But, you know if you only do it for one day it’s not going to make a great difference. In the same way you need to apply the process goals throughout your life. Losing weight successfully, keeping it off and improving your fitness requires you to complete process goals every day. If you reach your weight loss target and stop the process goals there is a good possibility that the weight will start to return. Don’t give up on the process just because you’ve reached your goal! The fact that you’ve reached your goal shows that the process works. You need to continue it to continue your success. So the next time you’re facing a difficult challenge, whether you trying new weight loss goals, or want to get that promotion; focus on the process.